Addicted to Pinterest, never far from Ravelry and guaranteed to have a knitting project at the bottom of every handbag (and dozens hiding behind the sofa), I’m an engineer during the day and a knitting designer after the kids go to bed. I use my engineering training to design clever knitting patterns that allow you to choose from a variety of techniques to make gorgeous toys as individual as you are. These fun-to-knit patterns grow from the toes up and can be assembled as you knit; guaranteed to amaze young children and make your knitting group smile. 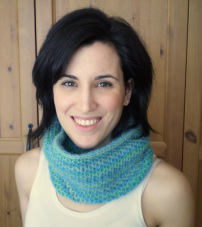 (Occasionally I also design a non-toy pattern, like the cowl in the picture). I love to hear from my customers. If you have any complaints, problems, ideas for future patterns or just want to say hi and show me pictures of your finished projects please drop me a note on Ravelry, leave a message for me on facebook or send me an email. I'm based in the UK and have a young family (and a day job) so it may take me a day or two to respond to your message, if you are stuck on a pattern you may get a faster response by posting in my Ravelry group as there is almost always someone online who may be able to help. If you would like to be the first to hear about new pattern releases, discount codes and test knits please join my mailing list. I hate getting overly frequent emails from businesses so expect to hear from me about once a month at best and certainly only when I have something interesting to tell you.